Maureen is the founder of Womanhood Global and creator of Tales of Womanhood. She is a proud mother of three children Donell 19, Sean 15 and Hannah Mae aged 2. She is happily married to her husband Don Mandipaza who she runs a successful Healthcare Business with. Maureen has lived in the UK for more than 20 years and her life is a testimony of courage and determination to succeed against all odds. Despite going through challenges herself, she teaches us that your failures are not your final destination but the beginning of self- discovery. Like any other woman on a mission, Maureen is a woman of many talents. Philanthropist at heart, she has the passion to empower, inspire and ignite women to be more and do more. Maureen is the founder of Womanhood Global, an organisation that empowers and supports disadvantaged young women in Africa and has been actively involved in championing successful fundraising projects and initiatives to support this client group. When you first launched the Tales of Womanhood back in 2018, your intention was to allow women from all walks of life to share their life challenges by contributing with a chapter in the anthology. You never imagined that right after the launch in the UK , which was followed by a US book launch, your book will become an international platform and capture a global interest, from Africa to North America, from London to Helsinki. Here you are, the leading voice of a an award winning book which is now launching the second book of the series! We both know how difficult it was at times, and how many tears were shared along the way…But look where you are now! What were your top challenges since we witnessed your first book launch in the UK? The book has been simply designed to up lift the readers with inspirational real life stories of women just like me, who have also passed through difficulties, trauma, injustice and poverty but have surpassed them and made it successfully to the finish line. My biggest challenge in completing the book is always coordinating eight to ten women from different backgrounds, from different continents, who all have different expectations from me as the lead voice of the message. It’s not always easy to get the stories back in time, to get the book publishing process to move smoothly up until launching day. The pressure is always on, from all sides. I have learnt that hard work and determination is the key to success to any goals. I have discovered that if I put my mind on anything I am able to deliver and I work well under pressure. I am driven by results. I would like to form an in house team, so we work together and focus more on the marketing, social media management, editing , PR aspects, as promoting the book is more important than writing the book! Are you planning on writing another book? If so what would you write about this time? I am thinking about the third book being the WOW book of the whole series. Has the book changed the perception about yourself? The whole process since I first started back in 2018 helped me see the best in other women and made me grow into the person who can uplift others, and deliver value to inspire others. I write from the heart and I encourage our co-authors to be authentic, so no there is no writing style- everyone is unique and should be allowed to write their own story and put their name on it. My desire is to encourage and equip the readers with hope and the desire to overcome their current life challenges, just like we did. There is light at the end of the tunnel. My advise is very simple: write your own story, you are the best person to share your tale. I would continue to reach out to women around the world restoring their self esteem, encourage them to become more without limiting themselves to what others expect of them. I move throughout the world without a plan, as I am guided by a divine plan, connecting through love for other women and trust that each one of us could the the serendipitous opportunity for another. My wildest dream is to build a women's academy to mentor more women who desire to become more. 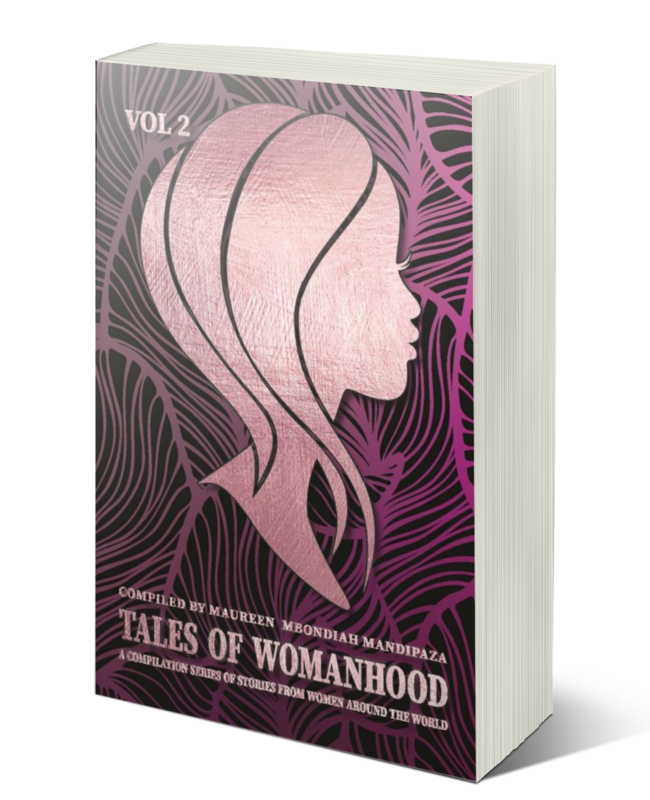 Tales Of Womanhood is a book series featuring powerful compilations of stories of women from across the globe. Derived from their true life experiences each writer shares how they used their strength and courage to overcome the challenges they’ve faced. Each of the co-authors tell us honestly how grief, depression, loneliness, health, cultural and family issues have affected them. Rachel Tracey is a teacher of secondary maths and a specialist biomedical scientist and director of the company TRACE Monday Motes which specialises in motivational services. Rachel lives in London, England. Her passion is seeing and effecting CHANGE through positive exchanges with people from all walks of life, but particularly with young people. Rachel believes in being more than mediocre and pushing hard to fulfil her purpose. She is an active part of her church community. She leads worship, is the acting assistant youth director and teaches in the Sunday school. Rachel believes in God's saving grace and has learnt on guidance from above to get her thus far through faith. Her biggest achievement to date is getting to know and accept herself. It is her prayer that all who come into contact with her or her words are blessed and encouraged. Monica better known as Hadassah Esther Author and founder of the Therapeutic Writing Group is an author specialising in biographies and personal stories. She is a Christian expressive writing therapist who facilitate client writing for self-exploration, typically followed by discussion of that writing to enhance self-awareness and personal growth. She has specialised in Therapeutic writing and has been using therapeutic writing techniques to express for years journaling privately her personal transitions. Journaling is an excellent way to extend therapy, offering a safe space to process and explore life`s journey. Writing is transformational and Hadassah Esther shows in Hiding Ugly Scars and Revealing Beautiful Scars the practical illustration of writing`s healing power. Her clients use Writing for Therapeutic Purposes on its own, as a means of exploring specific issues they have identified and wish to consider solely with this approach. She encourages clients to write to express and explore what she calls the inner core, and to gain a deep sense of who they are, where they have been and where life is taking them. In this context, therapeutic writing opens up a welcoming, accepting space to explore anxieties, challenges, celebrations and ethical issues of life in a flexible and original way. & has delivered workshops across the colleges delivering inspiring motivational content to help people live their true purpose & make better choices in their career. She also provides one to one or group coaching where she coaches aspiring & established entrepreneur’s to help them with starting up or up levelling their business. Tara also holds a leadership & Management qualification. She has an extensive back ground in Early Years after obtaining a combined BA Hons Degree in Childhood Studies an I.T with a 2:1 prior to this she holds the EYPS Early Years Professional Status & a Level 3 & 2 in Early Years Care & Education as well as the PTLLS Certificate Preparing to Teach in the Life Long Learning Sector. She has gained certification in Strengthening Families an Communities an was a part of an Inclusive Parent Programme. Her other qualifications include the Social & Emotional Aspects of Development in Adults an Young Children and a Fashion Photographic Level 3 Certificate in Makeup she also attended the London College of Beauty Therapy an holds a Certificate in Day & Evening & Special Occasion Make-up an holds 2 Art certificates. Tara has a strong passion for Fitness an Well-Being & has competed in a Half Marathon raising just under £500 for Cancer Research Uk, she has since competed in several 5k runs an is a part of the National Park Runs in her area. In Tales of Womanhood Tara Burgin tells her story of how her struggle to survive an create a better future for herself and her daughter was her ultimate driving force. . After falling pregnant and having her daughter at 19 she describes feeling lost, confused an feeling down she later was diagnosed with post natal depression. . Later she realised that she was not a product of her failures but rather a work in progress of & the pain & struggle was only defining an strengthening her character to propel her to the next chapter in her life and... . ...At the age of 27 Tara opened her own Children's Day Nursery Tara's P.A.L.A.C.E (Play & Learn & Creative Education) . In life we must endure the struggle an see every set back every negative word that hinders us as an opportunity to propel us an so you progress to the next stage in your life or business. . Her story highlights her strong will power an determination yet also self belief to not give up even when there was little support around her. . She now is a strong advocate for empowering others Business & Empowerment Coach and is currently the founder of the B.O.S.S Biz Bootcamp an acronym for Built on self success as she believes we are all a boss in our own right however we have been conditioned by society an those around us to "not be too much" or live a mediocre life the camp will deliver powerful interactive workshops to inspire an motivate people to be the best version of themselves and to make better choices in life or business she will use her 10 years of business expertise, lessons & failures to empower aspiring entrepreneurs an established entrepreneurs with either starting up or up-levelling their life or business. Memory is a politician in Zimbabwe under the Movement for Democratic Change Alliance party. She won an award as The Best Woman Leader in MDC Alliance in 2017. She studied Global Youth Work and acquired principled negotiating skills at the Open University in 2005 and is currently studying Psychology with the University of Unisa. She is a hardworking single mother to two astounding children. Her youngest recently scored 15 points at A level and is waiting to take up a place to do Medicine at the University of Zimbabwe in Harare. Born and raised in a Christian family, Tsitsi has developed her trust and ability to find God in the mysteries of life, one of which she talks about in this book, Tales of Womanhood. She writes about eventful moments which she experienced soon after relocating to Australia in 2014. Many believers are of the view that Christianity is the end of problems, but the bible does make it clear that many hardships and perplexing situations do confront believers. Being a Christian does not mean the absence of problems, it is about how you overcome them. Even after David had been anointed by Samuel to be King of Israel we see him going through many problems in his life, to the extent that the then king who also happened to be his father in law, Saul, tried on several occasions to kill him, but because of faith, trust and patience in God, he overcame it all and became a great, prosperous and peaceful king. To anyone that might be facing any form of difficulty, just know that your situation will not have defeat as its final result. It will become an occasion to show God's glory. Michelle studied Psychology and Sociology in the Seychelles where she worked in a rehabilitation centre. She also worked for the Air Seychelles Airline. She has a 'Certificate in Mortgage Advice and Practice,' and has 10 years' experience in the banking industry. Michelle began as a cashier and worked her way up becoming a mortgage manager and a financial advisor, before she left to become a full time home-maker. Michelle is a devoted wife and mother. She home schools her children and is the owner of MichBakes, her homebased baking business that she runs along with her husband. They specialise in ‘Free from’ (gluten, wheat, soya and dairy free) cakes for all occasions. She is in the process of getting her first book published. Michelle lives in the UK with her wonderful husband Douglas and their five children. She is an active member of her church community and teaches at the Sunday school. Having been abused at a very young age and treated like trash, she is passionate about seeing people set themselves free from things that have bound them in fear. Her faith in God is what keeps her going. Heidi Marja Normann Einvoll, is 40 years old and a yoga instructor. Her technique helps people to learn to breathe again, The Breathwork technique. She is also an author and lives in The Northern Light country, Norway. In her book ‘Følelseskarusellen’, she shares her life story and her wisdom about life. The book is available in both Norwegian and English on Amazon. Heidi has also been a co-author in the number 1 bestselling book ‘The better business book,’ which has been featured in Huffington Post. She has also contributed to the book ‘Your heart matters.’ In her books she talks openly and authentically about her life and the struggles she had to go through to change her life completely. Heidi wants people to wake up and be themselves, breathe deeply, follow their hearts and shine their light on others. Brenda Dempsey is a Survivor, Action Woman and Life Changer. From a young age (10) Brenda took action for starving children in Biafra, raising money and vowing she'd one day visit Africa and build a school. Brenda has recently returned from an entrepreneur expedition to Malawi. As a Survivor, her Strength, self-belief and resilience were her armour when she found herself homeless with four children after her abusive marriage came to an abrupt end. Brenda's grit, determination and vision of a better life for herself and family were the staying power she needed to complete her B.Ed(Hons) degree during this arduous time to fulfil her childhood dream of becoming a teacher. Transitioning is something Brenda embraces. After 25 years she left her beloved teaching to take up the challenge of changing lives and building a Revolution of 10 MILLION Spirited Leaders who are raising their Voices of Change, through writing, speaking and business. This creates a ripple effect, impacting change and providing extraordinary results for themselves, others and the world, through imagination, innovation and influence. Brenda is the founder of The VOW – The Voices of Women.